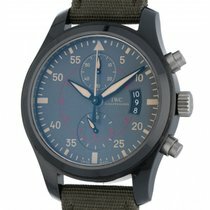 IWC Pilot's Top Gun Chronograph Watch. Limited Edition Miramar. 46mm Black Ceramic case with Titanium Top Gun case back & side pushers. Triple date feature display with chronograph feature. Flyback feature. Army Green fabric canvas strap. Self winding automatic movement, IWC Cal. 89365, 35 Jewels. In excellent like new condition. Strap shoes less then normal signs of enjoyment. 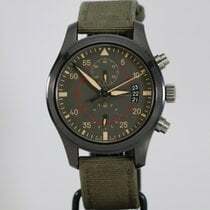 This Watch Is 100% Authentic. Your Satisfaction is our Priority. We are a small business that is very personal and will tend to your needs at every step of the way. All of our watches are in a personal safe, accessible the same day of payment. We try our best to price our merchandise very competitively if not the Best. We ask the same Courtesy in return from our buyers by making serious offers and committing to those offers. We work very hard to describe our watches, we guaranty that our description is the most meticulous on the market. 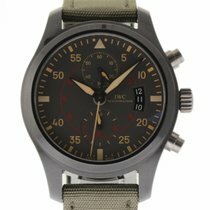 Each listing takes time to complete, and does not include the time taken to inspect and test the watch over 7 days of observation. Thank you for reading this. Shipping: FREE OVERNIGHT SHIPPING WITHIN THE US. $79.99 2nd DAY INTERNATIONAL SHIPPING VIA FED EX.